Down wind start against the tide to Hurst and pretty well blanketed off the line but managed to pull out to the front behind Paddiwack once we could get some clean air. Had to drop the spinnaker pretty sharpish as we approached Bridge as the Shingles bank was getting getting a bit close. Once round Bridge put a reef in for about a hour but shook it out later and made a pretty good crossing to Alderney. 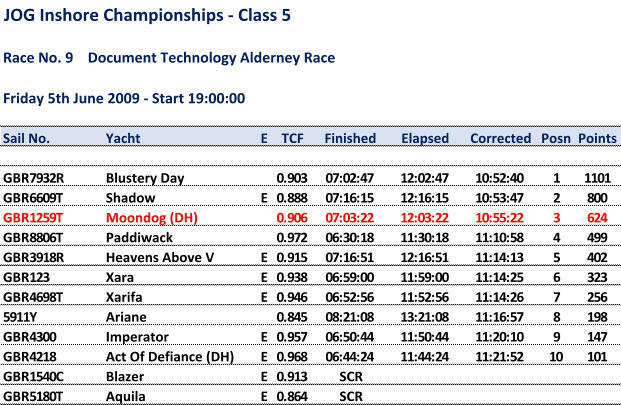 Probably a bit too far West as we were quicker than expected but not too bad a result with third overall and first two handed.